Born near Chambéry, Savoy, France, 1107; died June 26, 1178. Bishop Anthelm of Belley was a nobleman born in the castle of Chignin. He became a priest early in life, but after visiting the tranquil Carthusian monastery of Portes, decided to become a monk and joined the Carthusians about 1137. He eventually was elected as the 7th prior of the Grande Chartreuse in 1139. 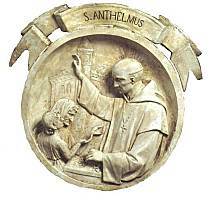 Anthelm was responsible for guiding the Carthusians to evolve into a religious order separate from the Benedictine. Charter houses had previously been separate and independent, subject only to local bishops. Not only did he revitalize the order, he also restored the physical facilities of the Charterhouse. He summoned the first general chapter, and Grande Chartreuse became the motherhouse. Anthelm commissioned Blessed John the Spaniard to draw up a constitution for a community of women who wished to live under Carthusian rule. He resigned as prior in 1152 to live as a hermit but was made prior of Portes. During this time (1154-56) he ordered the bounty that had accumulated as a result of the monastery's prosperity to be distributed to those in need. He returned to Grande Chartreuse, still wishing to live a solitary life, but then he actively entered the conflict over the nomination of Pope Alexander III, whom he supported, against Emperor Frederick Barbarossa's choice, Victor IV. With the Cistercian abbot Geoffrey, Anthelm galvanized support for Pope Alexander III, who then nominated him to the see of Belley in 1163. There he set out to reform the clergy, a particular concern being that of celibacy, because some priests practiced while being openly married. He also punished evil-doers. So much did Anthelm endear himself to the people that, after his death, the city was renamed Athelmopolis. When Count Humbert III of Maurienne violated the Church's jurisdiction over the clergy by imprisoning a priest, Anthelm sent a clergyman to handle the matter. After the priest was killed in a scuffle to rearrest him, Anthelm excommunicated the count. The pope invalidated the ban, but Anthelm would not relent and returned to Portes in protest. Relations between the pope and Anthelm remained open, however. He was asked by the pope to go to England to try to bring about a reconciliation between King Henry II and Saint Thomas a Becket, but unfortunately was unable to travel. Anthelm established a community for women solitaries. To the end of his life, his heart was in his beloved Charterhouse, which he visited on every possible occasion. The good bishop spent his last years tending to the lepers and the poor. He was distributing food in a famine when he was felled by fever. As Anthelm lay dying, he was visited by Humbert who sought his forgiveness. Miracles are said to have occurred at his tomb, one being that, as he was lowered into the tomb, a lamp lit only for great festivals kindled spontaneously.